This is NOT a normal harem anime, and this is NOT a normal mmo/fantasy anime! Warning! This anime haves some insane genre shifting, so prepare your mind for something that you are not going to see coming! The studio made a good choice to make the first episode one hour long, because if it had been shorter, it would have given a wrong image of what this anime is really about. Episode 1B - is where you are going to see what this anime is really about and where the anime really begins. I don't remember if I've ever been in the position of respecting a show (or anything) for making me hate it, by all appearances, deliberately. I wasn't sure if I should give it one star or five. The show feels like a one while you're watching it, but one feels like the creators wanted you to have a bad time... and they succeeded stupendously. So ... should I give it a five then? OK, two stars. That's fair. Interesting structure though - they really exploited the Groundshog day concept in a novel way. The story doesn't move in an arc, it moves in a loop. A terrible loop. A hideous loop. Glimmer of Hope --> Cringe --> Devastating Failure &/or Violent Death --> Mental Breakdown --> Hope. The plot doesn't progress, so much it renders. Like a rhetorical progressive jpeg, it all starts off fuzzy, unlcear, but with promise. And with each excruciating loop the story becomes a little sharper. When the story is finished rendering, and I've sat through Subaru screaming existential litanies at himself and others for cumulative hours, will the final picture be worth it? I very much doubt it. But the concept is very clever, so I guess they can have another star, just for that. Three stars it is. So, is there a limit to the number of times I can actually watch a character have very noisy mental breakdowns? Apparently not, since I catch every new episode half-hoping the story will take a completely different turn and break the loop, and the other half hoping he'll stay dead and the show will just end. But I'm going to keep watching it anyway. Apparently. *Sigh*.. Yeah OK have another star, you bastards. Hit's like a brick to the heart. After binge watching all the episodes, from 1 to 21, I can safely say that this one takes you on one hell of an emotional roller coaster. It starts out innocently enough, with our helpless protagonist put into a world he understands nothing of, and it evolves into a very emotional story about despair, love and at times hope and bravery. If you wan't feels, Re:Zero delivers in spades. The first series was pretty much linear plot lines. With a few game based diversions. It played out like most other "Game based" animes. The second series though is ebony black. Dark and magical. Death and dying are the plots and the subplots. It takes all the assumptions that you've had till that point and disfigures them in a knot of tangled, broken limbs. Watch as what you thought was a way out turns into yet another way to die. It cast such a black light onto boorish, selfish behaviour that is so common these days. It pokes fun at NEET's and Shutins - it turns the hero into an ANTI-hero. Its not finished as I write this, but I expect it will have a resolution. When the weak, pitiful, spineless youth have their lights punched out a seemingly endless amount of times. Its so bleak you know it has to have a better ending. I can't wait. Episode 18 has the only soliloquy I have seen in anime. The "protagonist" agonises over his abject failure as a person, in every possible way. His only salvation is the one he is with. Its very Shakespearean. 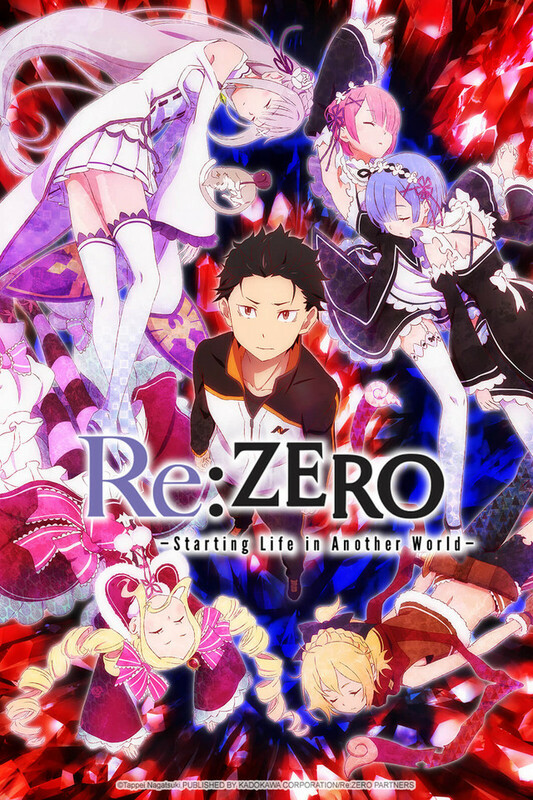 I'm relatively new to anime, but I was very impressed with the writing of Re:Zero. I'm hoping there is a second, and third, and fourth, season and that the story expands. There are still a lot of unanswered questions and a lot of places for the story to go. Judging from the current animation, the way the story is told and the 22 chapters of manga that are available for this anime, I can tell you this is one of the most interesting stories I have read. The artwork compliments the story very well and later on in the story a very unique atmosphere (vibe) is created. I won`t spoil anything but I'm confident to say that this anime deserves 5 stars already. I rewatched it 3 times in almost a week. I just adore it, I still am yet to look at it in a critical sense because my passion and emotion for the characters is still so ingrained into my soul haha. and a story that will stay with you forever, this is an anime you simply cannot miss. It deeply saddened me once finished to realise I may have to wait two years to get another season, but nonetheless, you HAVE to watch this anime. this show really put me excited every sunday besides of it left me waiting for the next episode every week this is not any harem or kind of this show really is worth watching. I remember when a decided to give it a chance it was around the episode 15 and at first i thought "well it have the pretty girls and the rpg settled so then..." but while i was watching more caps its history really catch my eye. So here i am writing this review ready for re:watch this awesome anime and look forward the season 2!! This anime has been my life. This is an anime about a boy who gets transported into another world and is also "gifted" with the ability to reset to a save point when he dies. its sounds like a pretty normal run of the mill anime's right? WRONG. watch at least three episodes of this anime and you will be hooked, and suffer heartache and be repeatedly annoyed to death by the main character and also feel for him. never have i seen a main protagonist in an anime go through so much crap. this is a great anime, so much mystery surrounding the characters and so much love for the them, the voice acting is by far some of the best work I've heard in an anime in a long time. definitely put this on your watch list. Any anime where you genuinely feel attached to the characters and on the edge of your seat for the next episode deserves this. This is one such anime. The fantasy genre is taken and spun by the main character who has faults, doubts and shortcomings. It is these that the series explores and makes you think, "What would I do in that situation? Would I run? Fight? Or even be able to survive under such circumstances?". Give the series a shot, you won't regret it.